We are living in a world where connection and communication is so critical to life. We drive next to each other on the same roads, we all go to the same grocery stores and schools, and most of us have no way of even surviving without each other and without that interaction. But what if things changed.... what if we needed to be prepared to survive on our own if all else fails? How many of us could survive? Just as importantly as having an insurance plan is having a friend or family member who has a farm in the country where we could go to survive a disaster. We often hear about the possible disasters that could effect mankind like an astroid striking the earth, or a supervolcano like yellowstone erupting, or even an EMP device robbing us of all of our power devices. I don't know about you, but I never stopped to think about the Ebola virus when I watched zombie epocalypse, but it's a pretty close analogy, and we are in the middle of it's worst epidemic to date. This is what I just read from the New York Times, and I thought I would pass it along. Keep in mind what you would do knowing that you could contract the disease by being sneezed on. Would you just stay home? Could you survive at home? Ebola - How many people have been infected? More than 1,800 people in Guinea, Liberia and Sierra Leone have contracted Ebola since March, according to the World Health Organization, making this the biggest outbreak on record. More than 1,000 people have died. Nigeria also reported 13 cases and two deaths. Two American aid workers infected with Ebola while working in West Africa were transported to a containment unit in Atlanta for treatment. What are the chances of getting Ebola in the United States? Two American aid workers infected with the Ebola virus while working in West Africa are beingtreated at a hospital in Atlanta, in a containment unit for patients with dangerous infectious diseases. But the risk that anyone will contract Ebola in the United States is extremely small, experts say. Doctors across the country are being reminded to ask for the travel history of anybody who comes in with a fever. Patients who have been to West Africa are being screened and tested if there seems to be a chance they have been exposed. Heightened concern about the virus led to alarms being raised at three hospitals in New York City. But no Ebola cases have turned up. If someone were to bring the virus to the United States, standard procedures for infection control are likely to contain it. It helps that Ebola does not spread nearly as easily as Hollywood movies about contagious diseases might suggest. In 2008, a patient who had contracted Marburg – a virus much like Ebola – in Uganda was treated at a hospital in the United States and could have exposed more than 200 people to the disease before anyone would have known what she had. Yet no one became sick. How does this compare to past outbreaks? It is the deadliest, eclipsing an outbreak in 1976, the year the virus was discovered. You are not likely to catch Ebola just by being in proximity with someone who has the virus; it is not airborne, like the flu or respiratory viruses such as SARS. Instead, Ebola spreads through direct contact with bodily fluids. If an infected person’s blood or vomit gets in another person’s eyes, nose or mouth, the infection may be transmitted. In the current outbreak, most new cases are occurring among people who have been taking care of sick relatives or who have prepared an infected body for burial. Health care workers are at high risk, especially if they have not been properly equipped with or trained to use and decontaminate protective gear correctly. The virus can survive on surfaces, so any object contaminated with bodily fluids, like a latex glove or a hypodermic needle, may spread the disease. Why is Ebola so difficult to contain? In some parts of West Africa, there is a belief that simply saying “Ebola” aloud makes the disease appear. Such beliefs create major obstacles for physicians from groups like Doctors Without Borders, which are trying to combat the outbreak. Some people even blame physicians for the spread of the virus, and turn to witch doctors for treatment. Their skepticism is not without a grain of truth: In past outbreaks, hospital staff who did not take thorough precautions became unwitting travel agents for the virus. 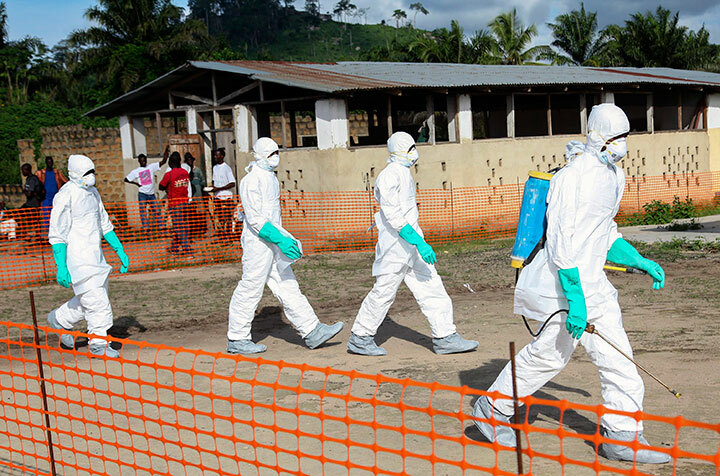 Liberian health workers on the way to bury a woman who died of the Ebola virus. Symptoms usually appear about eight to 10 days after exposure, according to the Centers for Disease Control and Prevention. At first, it seems much like the flu: a headache, fever and aches and pains. Sometimes there is also a rash. Diarrhea and vomiting follow. 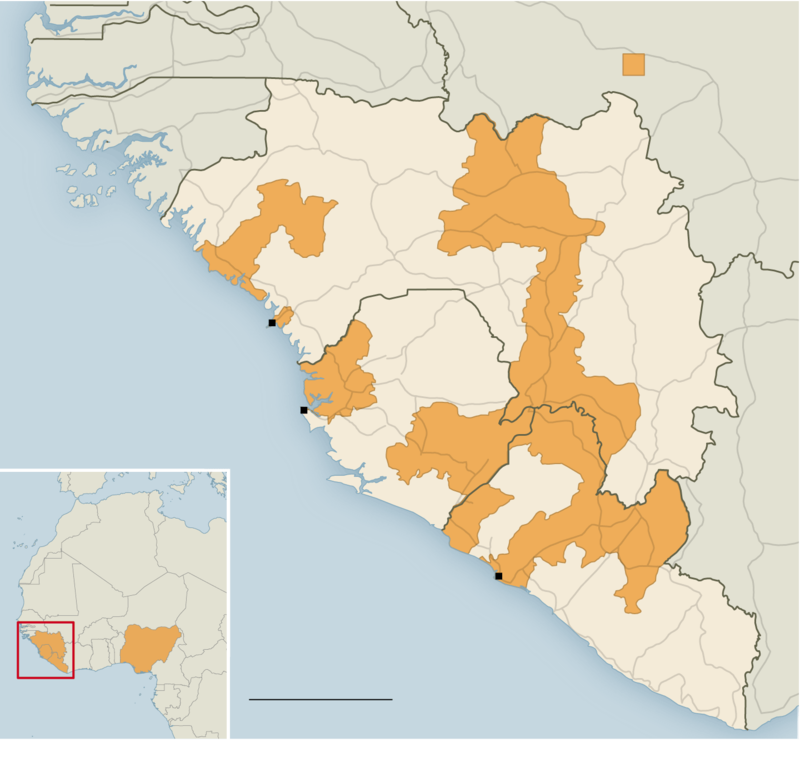 Then, in about half of the cases, Ebola takes a severe turn, causing victims to hemorrhage. They may vomit blood or pass it in urine, or bleed under the skin or from their eyes or mouths. But bleeding is not usually what kills the patient. Rather, blood vessels deep in the body begin leaking fluid, causing blood pressure to plummet so low that the heart, kidneys, liver and other organs begin to fail. There is no vaccine or cure for Ebola, and in past outbreaks the virus has been fatal in 60 to 90 percent of cases. All physicians can do is try to nurse people through the illness, using fluids and medicines to maintain blood pressure, and treat other infections that often strike their weakened bodies. A small percentage of people appear to have an immunity to the Ebola virus. Ebola was first discovered in 1976, and it was once thought to originate in gorillas, because human outbreaks began after people ate gorilla meat. But scientists have since ruled out that theory, partly because apes that become infected are even more likely to die than humans. Scientists now believe that bats are the natural reservoir for the virus, and that apes and humans catch it from eating food that bats have drooled or defecated on, or by coming in contact with surfaces covered in infected bat droppings and then touching their eyes or mouths. How does Ebola compare with other infectious diseases in the news? The biggest headlines have tended to involve outbreaks of deadly viruses that medical workers have few, if any, tools to combat. The four most prominent are compared below. No cure is known for any of them, nor has any vaccine yet been approved for human use.